We all know standing at a desk all day can be physically exhausting, especially for those who are used to sitting for hours on end at work. 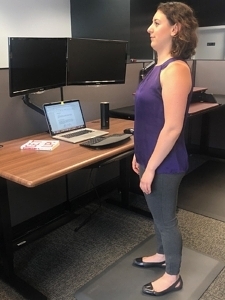 Weak core muscles, tight hip flexors, poor exercise techniques and weak gluteal muscles can make it challenging for standing desk users to maintain proper posture. 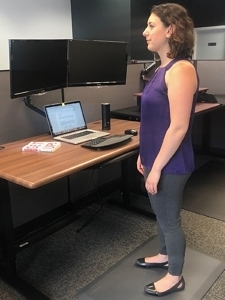 Standing (or sitting) at a desk with poor posture on a regular basis can lead to pain in your neck, shoulders, back, legs, or feet. 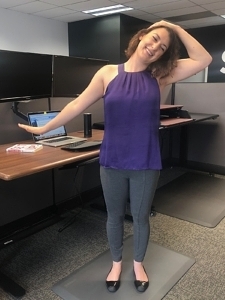 Here are just a handful of stretches that can be done in an office setting to prevent and relieve pain at your standing desk. Tuck your chin in slightly and gently slide your head towards the back of your spine so that it is on top of your cervical spine. It’ll feel like you’re pushing the back of your head into an imaginary headrest (as if you’re trying to create a “double chin”). Hold for a few seconds and repeat 5-10 times. 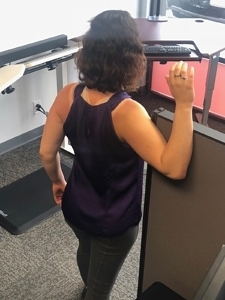 (I know it may look awkward, but it really helps combat “computer hunch”, the unhealthy posture we develop from leaning over to see our monitors). Relax your shoulders and upper back – your shoulder blades should slide down your back slightly. Stand with your arms by your side, with your palms facing downward. Tilt your head and neck to the right and feel the stretch on the left side of your neck. 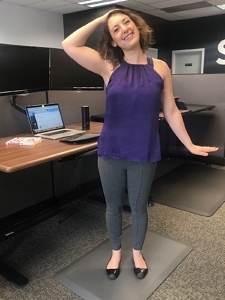 You can increase the difficulty of this stretch by pressing your left palm towards the floor, and use your right hand to gently press the left side of your head towards your right shoulder. You can also tilt your head down for an additional neck stretch. Find a doorway or a hallway where you can rest your forearm on the wall and walk half a step forward. You should feel the front of your chest—your pectoralis muscles—stretching. Experiment with different angles for a full stretch. 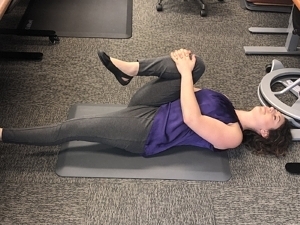 This exercise has been clinically proven to reduce back pain at work! 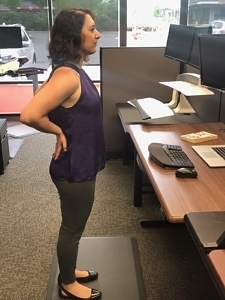 To do a standing back extension stretch, (called the “One Stretch” in the clinical study), start with your feet shoulder width apart. Place your hands on your lower back, with your fingers pointed downwards. 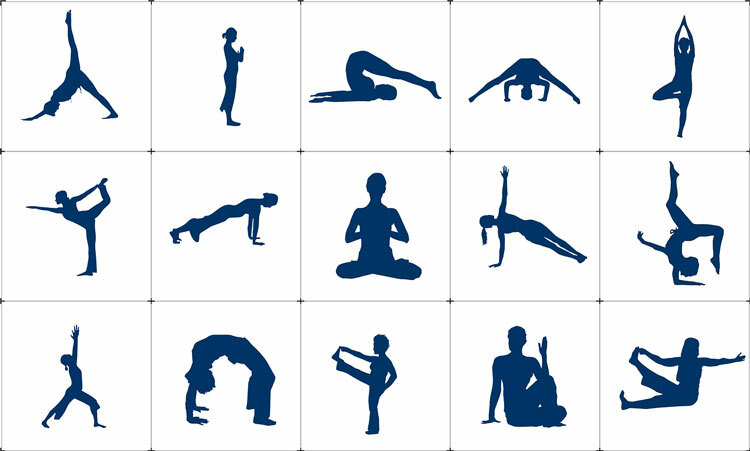 Stretch backward slowly as far as possible, while exhaling for 3 seconds without bending your knees. Slowly return to a neutral standing position, using your hands as support for your lower back. Repeat this exercise 1 or 2 times. Stand and cross your right foot in front of your left. Slowly lower your forehead to your right knee by bending at the waist. Keep both knees straight. Hold this position for 15 to 30 seconds. Relax. Repeat for the other side by crossing your left foot in front of your right. While seated in a chair (or on the floor), keep your feet firmly on the ground, facing forward. Twist your upper body in the direction of the arm that’s resting on the back of your chair. Hold pose for 10 to 30 seconds. Repeat on the other side. 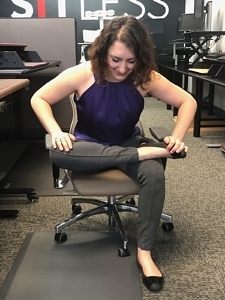 Seated in a chair, cross one leg on top of the other so that your ankle is resting on the opposite knee. Place one hand on the knee of the crossed leg. Gently lean your trunk forward while pressing gently on the crossed knee until you feel a mild to moderate stretch in the hip and glutes. Hold the stretch for 15-20 seconds, then repeat 3-5 times on each side. While lying on your back, slowly bring both knees up toward your chest. Grasp the knees with both hands (either on top or under the knee) and gently pull them up towards your chest. You should feel a mild to moderate stretch in the low back, hip, and glutes. Hold the stretch for 15-20 seconds, then repeat 3-5 times on each side. Another variation is to hold the right leg into your cheek while extending your left leg, and then alternate after 10-20 seconds. Start on your hands and knees. Spread your knees wide apart while keeping your big toes touching. Rest your buttocks on your heels. (Those with very tight hips can keep their knees and thighs together.) Sit up straight and lengthen your spine up through the crown of your head. On an exhalation, bow forward. Your chest should rest between or on top of your thighs. Allow your forehead to come to the floor. Keep your arms long and extended, palms facing down. Press back slightly with your hands to keep your buttocks in contact with your heels. Lengthen from your hips to your armpits, and then extend even further through your fingertips. Stay here for at least 20 seconds. This can be a great position to de-stress after a long day. 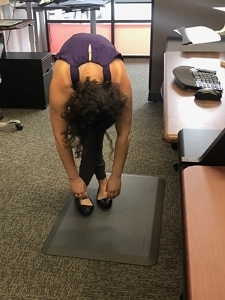 Now that you have this list of stretches, you’re equipped to keep your muscles happy at your standing desk, treadmill desk, or normal sitting desk. Enjoy! 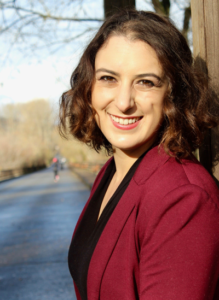 Victoria Lyon is Director of Corporate Wellness for Thermogenesis Group, Inc. She is a certified personal trainer and holds a Master’s Degree in Public Health from Washington University in St. Louis. Visit her blog at: www.lyonstrong.com.